The famous duo who started off on one of my favorite sitcoms, Full House, is continuing to take the world by storm. The Olsens’ highly talked-about fashion line, The Row, has given us bags to talk about because of their beautiful designs and exorbitant prices. The latest creation from The Row packs a hefty price tag punch in a compact bag, 5″ height x 7″ width x 2.25″ depth. 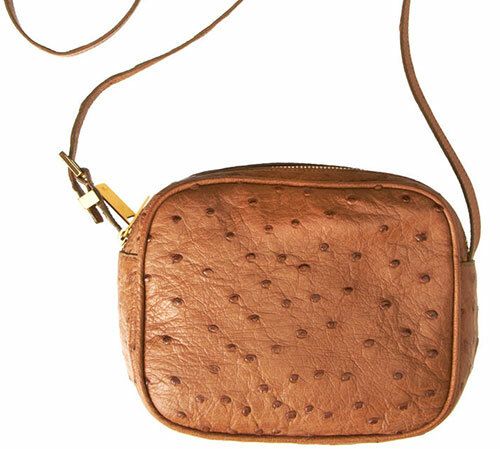 The Row Twin Mini Messenger Bag features contrasting pattern ostrich leather on either side. The shoulder strap is adjustable and long, and the interior has smooth leather lining and an internal zip pocket. The price is a whopping $4,700 via Barneys NY. Start of the year by telling us what you think: The Row Twin Mini Messenger Bag is ______.